This stately building on the corner of 3rd Avenue and 22nd Street usually arouses curiosity. Although now it’s a sports bar, it still evokes its religious past as Beth Israel Synagogue. Comparison of its appearance today with that on the early 1900s postcard shows many changes, yet much of its original style remains. The postcard shows towerlike projections at the corners and above the gable as well as decorative – corbelled –brickwork below the simple cornice. Sometimes the colors are inaccurately depicted on these old postcards, but in this example the red brick seems to be correct. The window sashes on the upper level have a star-like pattern created by muntins which separate individual glass panes. The arched lower window openings contain paired round-topped windows. Although many of these details have been removed or obscured by the application of stucco, the stonework trim is still apparent. Some of the star patterned windows are in place and the stone foundation is unchanged. The Argus reported work which cost $7000 had begun on the synagogue in 1901. In a thesis written in 1957, Oscar Fleishaker notes that it cost $12,000 and was dedicated on April 20, 1902. 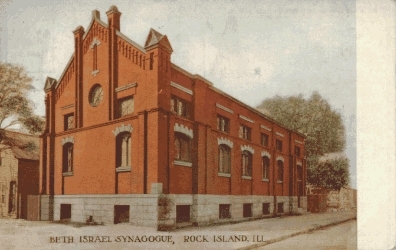 Bj Elsner, writing in “Rock Island: Yesterday, Today, and Tomorrow,” said that Beth Israel was Rock Island’s first synagogue. It does not appear in city directories until a few years later, when Moses Goldman was its pastor and Samuel Silverman was the principal of the Rock Island Hebrew Free School, which operated in the building. Although the exterior looks like a two-story building the interior was a single story with a very high coved ceiling. A curved balcony was located at the west end of the building, above the main entrance. Much interior woodwork remains as well. The basement is high and deep with large window openings and was probably designed as a pleasant space to house the Hebrew school. Another Jewish congregation opened a second synagogue, the B’nai Jacob, on 9th Street near 5th Avenue in the early 1900s. A former Swedish Lutheran Church (later to become First Lutheran) at 904 8th Avenue was also known as “Stodd’s Hall” and was used by Bnai Jacob from 1905 to 1913. In 1936, at the urging of I. C. Gellman, yet a third congregation, the Tri-City Jewish Center, was organized and made its home in the old Buford mansion. That is the topic of another postcard article. In 1950, Beth Israel merged with the Tri-City Jewish Center. The congregation sold their building shown on the postcard, to a heating and sheet metal company. A similar commercial use remained for the next 50 years. B’nai Jacob joined the Tri-City Jewish Center in 1969 when it became necessary for them to sell their 9th Street synagogue for urban renewal. That building was soon demolished, and is now part of the King Memorial playground. B’nai Jacob’s assets of $28,000, which included the price received for their building, were brought to the consolidated congregation. Notice the small house on the far left of our postcard. It is a simple house, which would later be known as the Mills Café. It was reputed to be a notorious bordello operated by Jenny Mills, who lived just south of the cafe in the adjacent house. A few copies of the 250 page hardbound book “Rock Island: Yesterday, Today and Tomorrow” are still available for purchase at the Rock Island County Historical Society. Originally published in 1988, it is an excellent compilation of local history. This article by Diane Oestreich is slightly modified from the original, which appeared in the Rock Island Argus and Moline Dispatch on June 23, 2002.